On 11th April 2016, the shortlist for the ‘Baileys Women’s Prize for Fiction’ was announced. As per usual, the twenty longlist nominees were whittled down to just six contenders. The winner will be announced on the 8th June 2016 at a prestigious ceremony which will be held at the Royal Festival Hall, London. Ruby quickly winds her way into the ripe center of the city-the darkened piano bars and hidden alleyways of the Village-all the while hoping for a glimpse of the red hair and green eyes of her mother. When a telegram from her cousin forces her to return home, thirty-year-old Ruby finds herself reliving the devastating violence of her girlhood. With the terrifying realization that she might not be strong enough to fight her way back out again, Ruby struggles to survive her memories of the town’s dark past. Meanwhile, Ephram must choose between loyalty to the sister who raised him and the chance for a life with the woman he has loved since he was a boy. Full of life, exquisitely written, and suffused with the pastoral beauty of the rural South, Ruby is a transcendent novel of passion and courage. This wondrous page-turner rushes through the red dust and gossip of Main Street, to the pit fire where men swill bootleg outside Bloom’s Juke, to Celia Jennings’s kitchen, where a cake is being made, yolk by yolk, that Ephram will use to try to begin again with Ruby. Utterly transfixing, with unforgettable characters, riveting suspense, and breathtaking, luminous prose, Ruby offers an unflinching portrait of man’s dark acts and the promise of the redemptive power of love. Hanna, Dan, Constance and Emmet return to the west coast of Ireland for a final family Christmas in the home their mother is about to sell. As the feast turns to near painful comedy, a last, desperate act from Rosaleen – a woman who doesn’t quite know how to love her children – forces them to confront the weight of family ties and the road that brought them home. 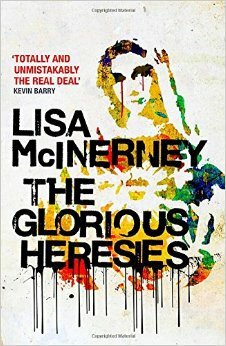 One messy murder affects the lives of five misfits who exist on the fringes of Ireland’s post-crash society. Ryan is a fifteen-year-old drug dealer desperate not to turn out like his alcoholic father Tony, whose obsession with his unhinged next-door neighbour threatens to ruin him and his family. Georgie is a prostitute whose willingness to feign a religious conversion has dangerous repercussions, while Maureen, the accidental murderer, has returned to Cork after forty years in exile to discover that Jimmy, the son she was forced to give up years before, has grown into the most fearsome gangster in the city. In seeking atonement for the murder and a multitude of other perceived sins, Maureen threatens to destroy everything her son has worked so hard for, while her actions risk bringing the intertwined lives of the Irish underworld into the spotlight . . .
Annie McDee, alone after the disintegration of her long-term relationship and trapped in a dead-end job, is searching for a present for her unsuitable lover in a neglected second-hand shop. Within the jumble of junk and tack, a grimy painting catches her eye. Leaving the store with the picture after spending her meagre savings, she prepares an elaborate dinner for two, only to be stood up, the gift gathering dust on her mantelpiece. But every painting has a story – and if it could speak, what would it tell us? For Annie has stumbled across ‘The Improbability of Love’, a lost masterpiece by Antoine Watteau, one of the most influential French painters of the eighteenth century. Soon Annie is drawn unwillingly into the art world, and finds herself pursued by a host of interested parties that would do anything to possess her picture. For an exiled Russian oligarch, an avaricious Sheika, a desperate auctioneer, an unscrupulous dealer and several others, the painting symbolises their greatest hopes and fears. In her search for the painting’s true identity, Annie will uncover the darkest secrets of European history – and in doing so, she will learn more about herself, opening up to the possibility of falling in love again. Irreverent, witty and sharply sweet, The Improbability of Love explores the confusion and turmoil of life and the complexities of love, loss and hurt – revealing the lows to which human nature can stoop and the heights to which the soul can soar. A riotously funny and deeply insightful adventure through capitalism, the medical industry, family, love, war and wedding-planning – from an electrically entertaining new voice. The prize for winning is, a cheque for £30,000 and a limited edition bronze statue known as a ‘Bessie’, created by the artist Grizel Niven. We wish all the nominees ‘Good Luck’.